Rotational dining is unique to Disney Cruise Line, and the three dining rooms on the Disney Dream showcase cuisine that beautifully fits with each theme. Here’s a look at Animator’s Palate, Royal Palace and Enchanted Garden, with our favorite dishes. 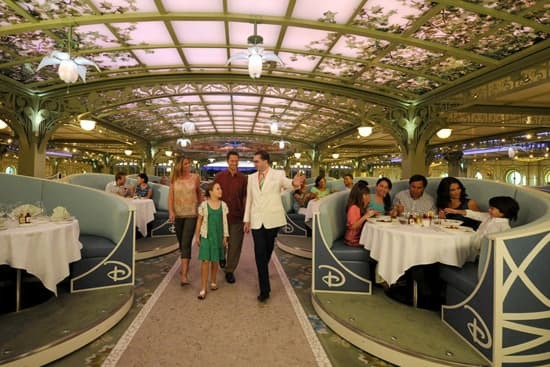 In case you haven’t been aboard the Disney Cruise Lines ships, rotational dining is a way of making sure each guest experiences each of the dining rooms. 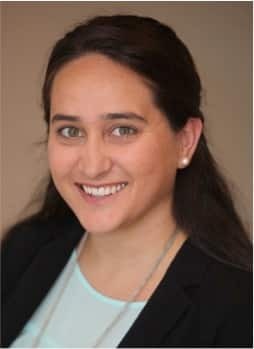 Every evening you have the same tablemates and the same servers as you “rotate” – you get a schedule when you board which tells you exactly when and where to go. Have you sailed on the Disney Dream and have your own favorite dining room and dish? At Animator’s Palate, we were too busy looking at all the fun animation touches – character sketches, character models, scenes from Disney and Disney•Pixar films – to focus on our menus, but our patient server said he was used to his guests being wowed by the décor. 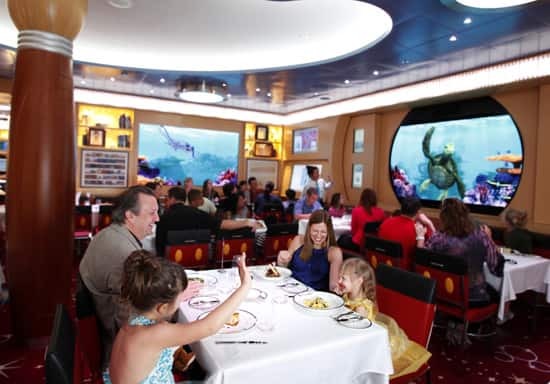 And it only gets better: during dinner, the undersea world of “Finding Nemo” comes alive via more than 100 video monitors on the walls – and Crush, the sea turtle, was talking to us! When we finally focused, what a feast. Favorites included black truffle pasta “purseittes,” little pasta “purses” filled with truffle-scented cheese in a Champagne sauce; the simple smoked salmon tartare; the rich, sesame-flavored rock shrimp and caramelized onion cheesecake (it’s a starter, not a dessert! ); and the grilled Pacific black cod. Our sweet ending was the chocolate brownie cheesecake. For vegetarians, the menu includes stir-fried veggies and black bean chipotle cakes. Meat lovers can choose from veal, beef tenderloin and chicken breast. Royal Palace takes an elegant approach (we love the whimsical chandelier that’s adorned with Cinderella’s glass slippers) with an upscale menu and Old World wines. It’s a great place to try escargot if you haven’t; their version has finely chopped mushrooms and lots of garlic butter. And we loved the avocado citrus salad with a citrusy vinaigrette, a favorite we now make at home (recipe below). Our favorite entrée was the wild boar tenderloin, but there’s also beef and lobster, double-cut rack of lamb and salmon with a horseradish crust. We also enjoyed the wild mushroom pasta in a light broth, a nice vegetarian option. For dessert, hands-down favorite was the no-sugar-added mango cheesecake. Yum! Walking into Enchanted Garden feels like spring no matter what time of year, thanks to the 600 light panels arching across the ceiling like a glass canopy, white trellises, a terrace fountain (with a cherub Mickey Mouse) and gorgeous flower light fixtures. If the setting makes you want to eat lightly, try the golden and red beet carpaccio or the curried carrot and apple soup. Entrées include our favorite pan-seared sea bass with risotto, caramelized sea scallops with roasted asparagus, pork tenderloin with citrus-flavored polenta cakes and a hefty New York strip steak with a double-baked potato. The Enchanted Garden tuna salad features seared sushi-grade tuna and for vegetarians, there are glazed Portobello mushrooms with lentils and a sun-dried tomato cream drizzle or pearl barley cakes with shallots, leeks and rosemary. We ended our attempt at eating lightly with a bananas Foster sundae – rum-glazed bananas and a caramel sauce. We’ll count calories tomorrow. If you’re not sailing soon, here’s a taste of Disney Dream dining – one of our favorite recipes from Royal Palace. 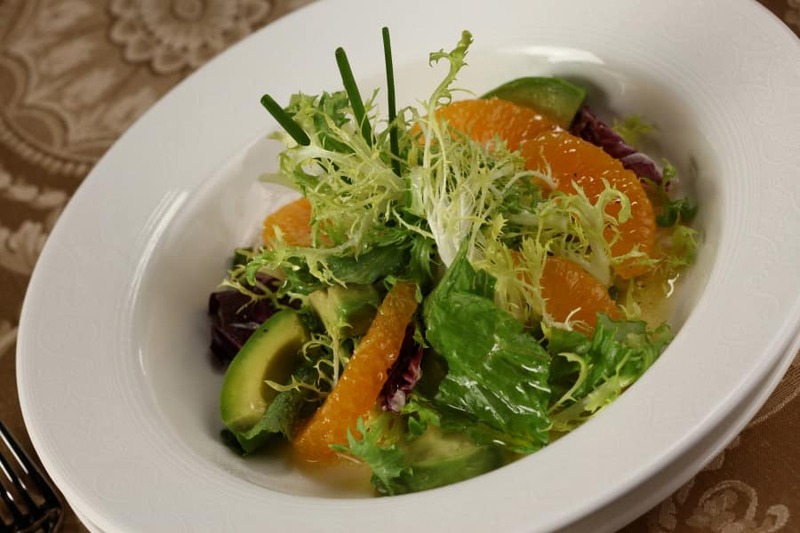 The buttery avocadoes and oranges with a light, citrusy vinaigrette make a perfect spring salad. Cut avocadoes into 3/4-inch-thick slices. 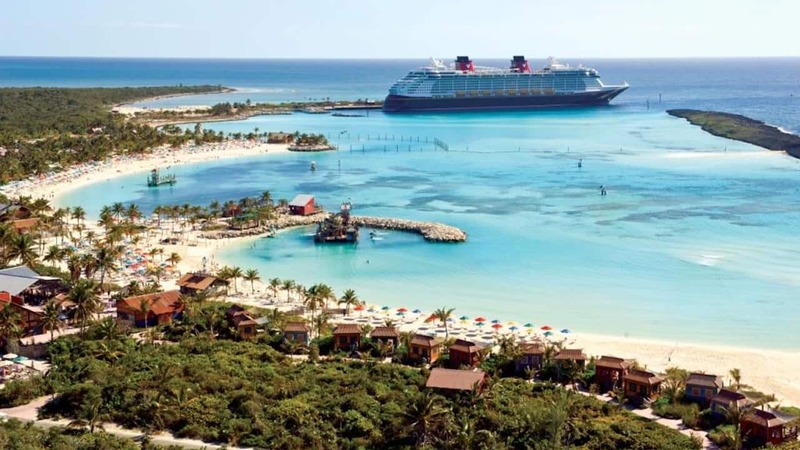 Our first Disney cruise was a 3 night in December 2010 aboard the Wonder. The food was great & the service was awesome! Thanks to our server “Alex” (who was the best) for creating a memory for my children that they will never forget. They ask about you all the time. We booked a 7 night cruise on the Fantasy in October 2012 & I hope that the service will be as enjoyable as on the Wonder. We sailed on the Maiden Voyage of the Dream. The restaurants are beautiful, but at 2 out of three seatings we were “tucked” back into little dull rooms and missed the ambience of both the Royal Palace and the Enchanted Garden. Our servers were good, but the whole waitstaff was still trying to figure things out and dinner lasted too long. We often filled up on too much bread between courses. I was impressed with Waves Buffet for breakfast and lunch. It was so much more open and appealing than the buffet on the Wonder and Magic. I really liked the dessert options where you could order a mini sampler of desserts. We sailed on the Dream in March. The best restaurant for fun was Animator’s Palate. The food was great, but the best main courses was in Enchanted Garden! We actually ordered 3 main dishes (Carmelized Sea Scallops, Enchanted Garden Tuna Salad & the very best was Pan-seared Sea Bass was awesome! If I could get any of these recipes, it would be fabulous! I would love if the recipe for the Black Truffle Pasta at Animators could be posted. We were on the Disney Dream last weekend and these were delicious. I probably can’t make them as good as Disney but I would sure like to try. 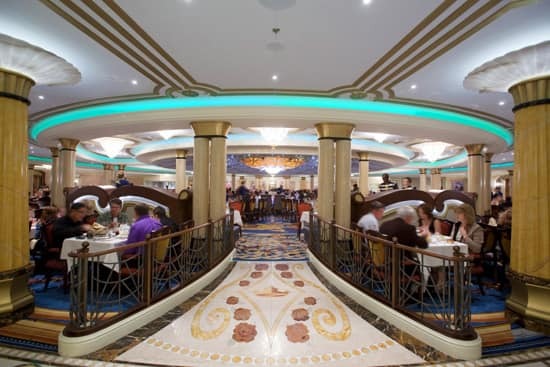 Having just sailed on our first Disney Cruise in March on the Disney Wonder, we loved the food, the service, and the rotating restaurant seatings… oh, did I mention the food? Such an experience. The servers will bend over backwards for you. Absolutely the best. The one down side to rotational dining is that if you have poor servers they follow you around. My cruise on the Wonder we had great servers. One the maiden voyage of the Dream, not so good. The wave buffet is the way to go for breakfast. We did a sit down breakfast at Royal Palace and the service and food were both bad. The Wave Buffet was always good. 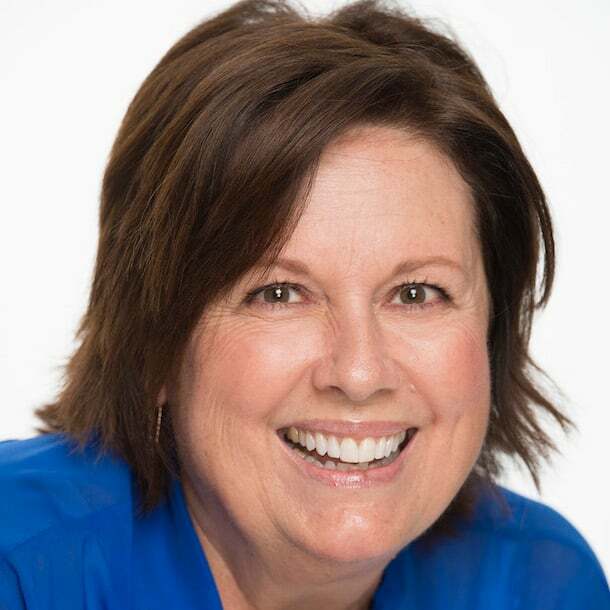 You highlighted some of my favorites, Pam – the rock shrimp cheesecake (I am definitely trying that recipe!) and black bean chipotle cakes from Animator’s are two of my favorites. I haven’t tried the no sugar added mango cheesecake but wanted to put in a plug for the no sugar added desserts in general – DCL does an outstanding job with those, and I often choose the no sugar added dessert over one of the “regular” desserts because they are so tasty. I’m not much of a salad eater, but that looks absolutely delicious! The restaurants are absolutely beautiful too. I hope to eat at the Enchanted Garden someday.